Let Mammoth Lakes serve as a base camp for all your adventures in the Sierra’s, including Sequoia National Park. Home to the highest peak in the continental United States, the world’s largest tree, 240 caves, and seemingly limitless opportunities for outdoor recreation, this park is not to be missed. Consider combining your visit with Kings Canyon National Park, the parks are jointly administered and your pass is valid at both parks. 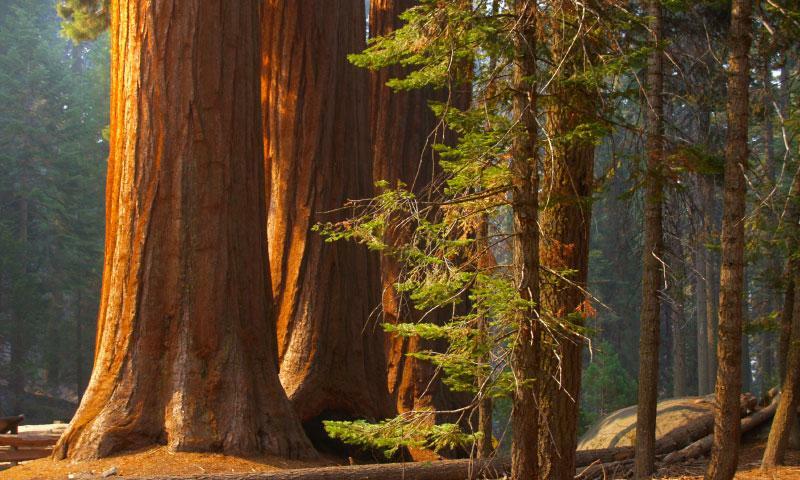 Visit the General Sherman Tree, the largest known living tree in the world. Hike on over 850 miles of maintained trails. Popular destinations include 1,200’ Tokpah Falls, and panoramic Buena Vista Peak. Tour Crystal Cave, a 3.4 mile underground cavern, and the second largest in Sequoia National Park. A 7-day vehicle pass is just $20.00. At 404,051 acres, visitors to Sequoia National Park are treated to a land of extremes. The park is home to the world’s largest trees, The United States Highest Peak, 240 known caves, and mile upon mile of breathtaking alpine scenery. Sequoia NP is open year round. Heavy snows in winter impact driving conditions and many roads are unavailable during this time of year. Summer is the most popular time of year to visit as all park areas, roads, and facilities are usually open. Camping Fees range from $12 to $20 per night. The General Sherman Tree, with a height of 275 ft and a circumference at the base of 102 feet, is the largest known living tree on the planet. It’s estimated that the tree is between 2,300 and 2,700 years old. The second largest cave in Sequoia, at over 3.4 miles, this is the only cave in the park still open to visitors. To venture inside, join one of the guided tours. Tickets can be purchased at the Lodgepole or Foothills Visitor Centers. With over 850 miles of maintained wilderness trails, Sequoia and Kings Canyon boast enough trails to keep even the most ambitious hiker busy for a lifetime. Here are a few of the more popular walks in the park. This 2 mile hike brings visitors to the top of Buena Vista Peak. You’ll be treated to a 360 degree panorama of the park, including the Sequoias in Redwood Canyon, and Buck Rock Fire Tower. Find the hike south of the Kings Canyon Overlook on the Generals Highway. This 3 mile hike begins just beyond the Marble Fork Bridge in Lodgepole Campground. In addition to impressive granite cliff faces and tranquil river walking, the hike finishes with a view of Tokopah Falls, a 1,200’ cascading waterfall. Climb a 1\4 mile staircase to the summit of this granite dome for views of the Great Western Divide and the western half of the park. There are no roads that enter Sequoia NP from the east (US-395) so you’ll have to proceed around the park and enter from the west side. From Fresno, take CA – 180 W toward Sequoia and follow signs for the park entrance.